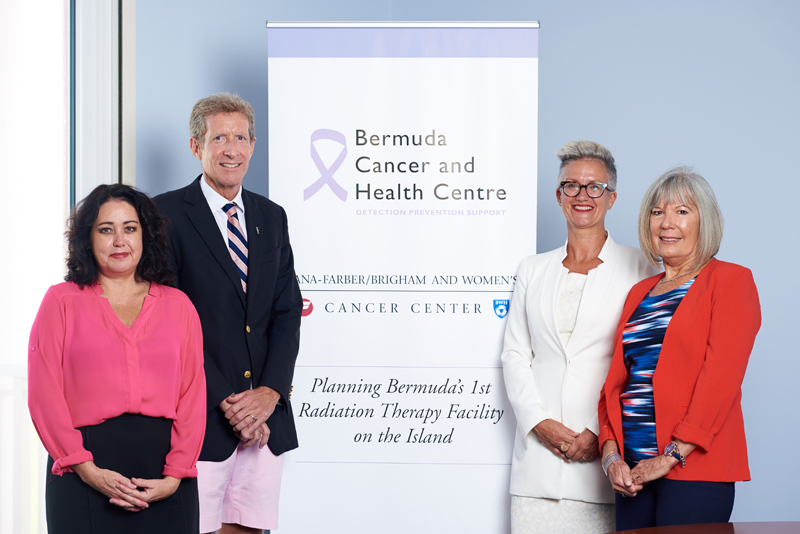 Bermuda Cancer and Health Centre [BCHC] have received commitment from BF&M Limited and the Argus Group to supporting BCHC in the provision of radiation therapy locally to Bermuda’s residents. The insurers will donate $250,000 each towards the completion of a new building to house Bermuda’s first radiation facility, which will offer Bermuda residents the ability to receive treatment currently only available overseas, here on the island. BF&M CEO John Wight explained: “As leading health care providers on the island, we have a responsibility to make a difference in the quality of treatment offered locally to our community. Alison Hill, Chief Executive Officer of the Argus Group, stated: “We are proud to support Bermuda Cancer and Health Centre in their initiative to house Bermuda’s first radiation facility. Tara Curtis, Executive Director of Bermuda Cancer and Health Centre, said: “Bermuda Cancer and Health Centre truly appreciate the financial support received from BF&M and Argus in helping us to achieve this important Radiation Therapy Initiative. “Over the past ten months, BCHC has worked closely with the Dana Farber/Brigham and Women’s Cancer Center, which is ranked 4th in the USA for cancer care, for the design and construction of the facility and recently BCHC signed a contract for the Truebeam treatment system, the latest technology available for radiation therapy treatment”. This is good news but why the need for the dishonest, or at least disingenuous comments? The fact is that this facility will improve your bottom line by providing a less expensive option than overseas treatments. There is nothing inherently wrong with the desire to cut expenses and improve profits but why the need to disguise that behind this altruistic rhetoric? I have a hard time with people who manage to find the negative in something so very positive. We need less of these comments in Bermuda. Perhaps next time just consider the good that will be done as a result of this, regardless of your negative perception. The cost of a flight and hotel is small compared to the cost of radiation therapy. These savings dont necessarily filter down to the shareholders they often get passed on to the policyholders paying the premiums in the form of premium reductions or lower premium increases. Healthcare in Bermuda is on a path towards collapse (aging populace, exodus of younger often healthier expats and their premiums, more unemployment etc.) as less people are paying the premiums for the sick. These types of savings could simply allow Bermuda to have a viable health care system. So cynicism, while understandable, over simplifies our current situation. Well that certainly makes sense because in the end both companies will be saving huge amounts from people being able to have treatments in Bermuda. It is a wonderful treatment to have available in Bermuda because it will be accessabile to every one, until you have spent 8-12 weeks or longer overseas having radiation by yourself because you dont have family members to stay with you as they have to work, the financial burden it puts on people to go overseas for treatment will be removed by having this available here, and also you will be able to have the love and support of your family while you go through this treatment. Iam unsure why people seem to have a problem with such a good thing, i would guess they have never had to experience going overseas for treatment and all in entails.